Days later my friend Bill, who is an amateur astronomer, solved the mystery for me. “Venus is exceptionally bright in the sky right now”, he said. That got me to thinking about the Christmas Star, it being Christmas and all. Could there really have been a “Star of Wonder”. In ancient Roman times Astronomy was indistinguishable from Astrology. The ancient records throw some light on this question but not without controversy. Nonetheless, based on the evidence, it is generally accepted that the birth of Jesus must have occurred shortly before the death of Herod the Great in 4BC. This is in conflict with a birth date of 1AD, which is the start of the Christian system of the counting of the years. “The system of counting the years was miscalculated by Dionysus Exiguus, a Christian monk in AD 533. Even his colleagues thought he dropped a few years in counting the lengths of the reigns of the Roman emperors. Well-meaning people, however, have tried to move various dates around to rectify this discrepancy. For example, that Herod died in 4 BC has been challenged by a few people, but mainstream historians and numismatists (coin experts) stand firm with the spring of 4 BC for Herod’s death. If Jesus were born during the reign of King Herod, he had to be born in or before 4 BC”. Based on these conclusions, researchers started looking for heavenly phenomena in that time frame. With the advent of the computer, the game has changed. With the right computer software, and with great accuracy, it is now possible to literally “roll back time” in the heavens to see what the sky might have looked like at any given point in time. Both the historical records and modern-day computer simulations show an unusual set of planetary groupings, also known as conjunctions, during the years 3 BC and 2 BC. On 12 August, 3 BC, a conjunction of Jupiter and Venus occurred before sunrise. 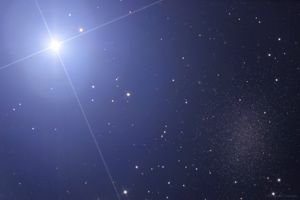 A bright burning morning “star” visible in the east of the Middle Eastern heavens from about 3:45 to 5:20am. Most significantly, a second conjunction occurred exactly 10 months later when Jupiter and Venus joined forces again in the constellation of Leo, appearing once again as a brilliant “star”, spectacularly visible to the naked eye. There has not been a brighter, closer conjunction of Venus and Jupiter in Leo in the 2,000 years before or since. Casting my mind back to my own experience of seeing a brilliant Venus in the predawn sky, I can just imagine what that conjunction of Jupiter and Venus may have looked like. Quite spectacular by comparison. Merry Christmas. Merry Christmas to you too, John. Your new blog is going to be a hit!